Many of us receive gifts that we will never use – another box of chocolates or bubble bath and soaps. So, why not give a gift that can make a real difference to someone’s life? Next time you are celebrating a special occasion such as a birthday, engagement, wedding, anniversary or Bar/Bat Mitzvah, take the opportunity to request that your friends give a donation to Jewish Care instead of giving you a gift. How Does Simcha Giving Work? 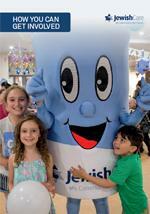 When you decide to nominate Jewish Care as your charity of choice, we can build a special Simcha Event page on our website that only you and your guests can see. When you send your guests their invitations, you can include the web page address and they can quickly and easily donate online. You will receive special acknowledgement of your support and everyone who makes a gift on the occasion of your simcha will receive a special thank you and tax deductible receipt. or you can give a general gift to Jewish Care and we will use your gift where it is needed most.